The MIST Project has now been underway in earnest for six weeks and it may be the right moment to let everyone interested know about some of the things that we are doing right now in the Project. We are busy preparing for the System Requirements Review in late March. The purpose of that is to correctly summarize the known requirements from the experiments and to assess their impact on the system design. To that end we are working with the experimenters to complete the so-called Interface Control Documents (ICDs) between the satellite and the experiments. The visit to Nanospace is an example of this effort. We have now taken a quick look at some operational scenarios when testing the CUBE Prop butane thruster system. What if the thrusters (4 mN in total) are operated only within view of the ground station? Would the orbital elements change noticeably? And what if the thrust would be applied downwards or upwards instead of along the velocity vector? If thrusting goes on during a 10-minute pass a velocity will change about 0.6 m/s. If this trust is applied vertically the eccentricity of the orbit will change slightly. 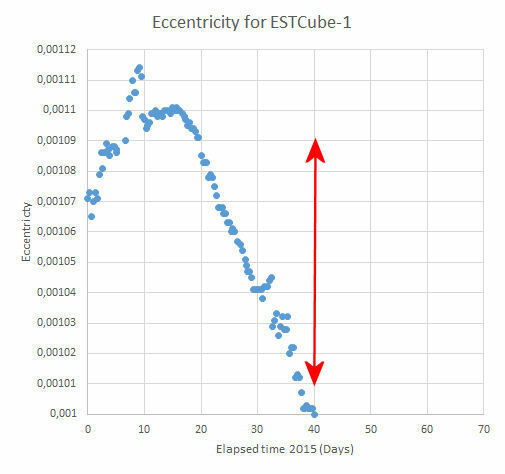 The expected change has been plotted against the natural eccentricity evolution of Estonia’s ESTCUbe-1 Cubesat and it is clear that even in such ground radar-derived orbital data the change in eccentricity from thrusting (red double-arrow) will show up clearly. Three experiments need a certain viewing direction in space. The figure below shows, in the so-called orbital frame, the requirements of these three experiments. 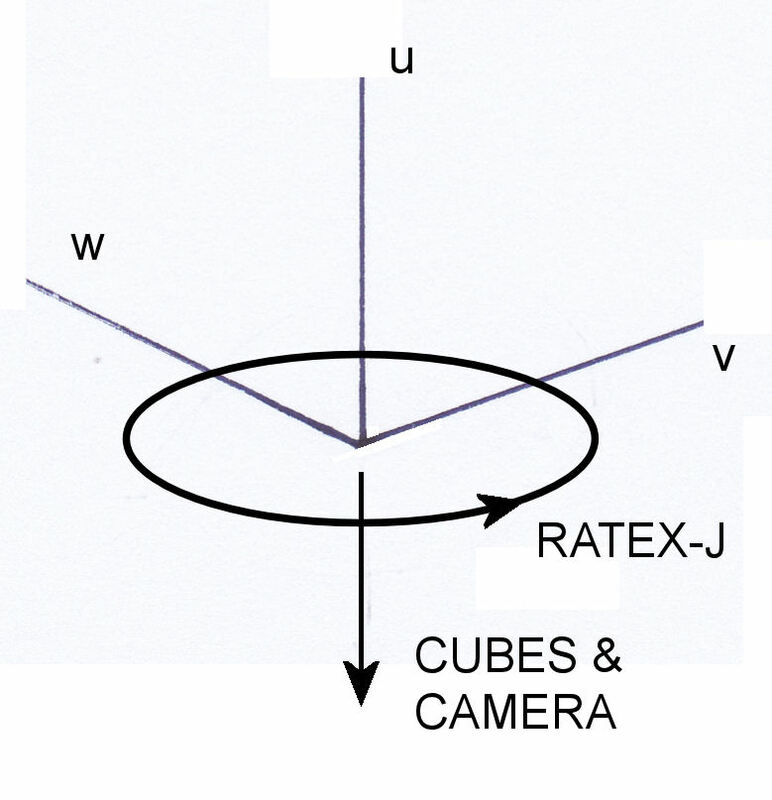 The u,v,w orbital frame is defined in this way: u points along the radius vector to the satellite from the Earth’s center, v is perpendicular to u and lies in the orbital plane and points in the general direction of orbital motion, w completes the right-handed coordinate system and points at right angles to the “left” of the orbital plane. Now we need to check how to fit these requirements into the x,y,z-frame of the satellite for various orientations of the satellite in the u,v,w frame. Got it? 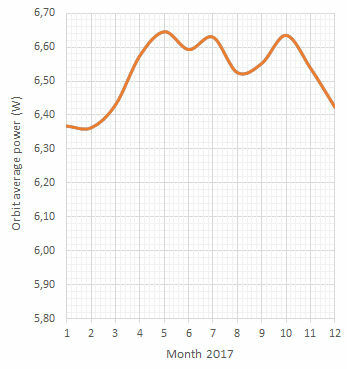 Another area under intensive work is the power budget for various attitudes and solar array configurations. This week a software algorithm for computing the effect on the solar panels from sunlight scattered by the Earth’s atmosphere was completed. This effect may contribute 10% to the available power. That does not sound much but every little bit helps! 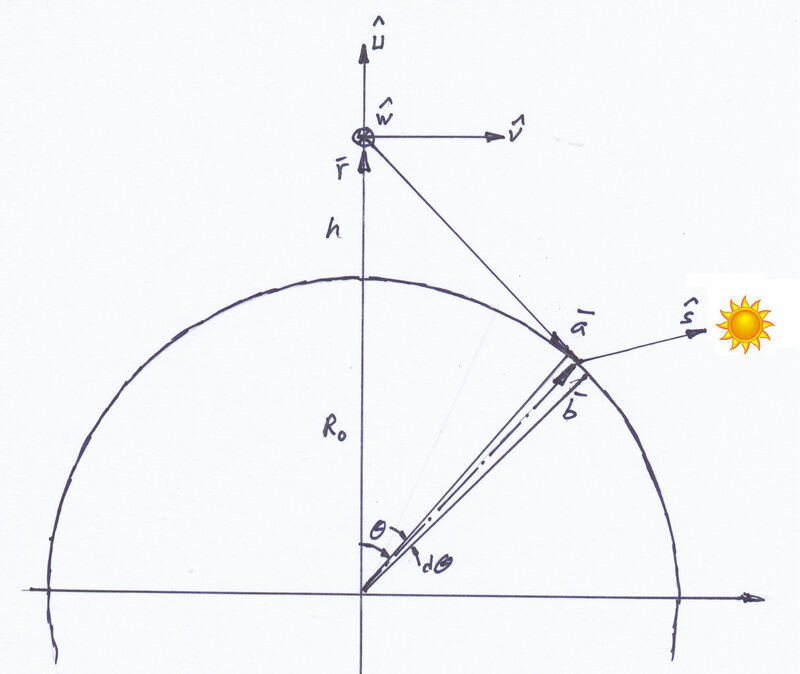 The figure below shows the geometry of the light scattering. The contributions from every visible part of the Earth have to be computed and summed. Eventually we will obtain plots like this to show the orbit-average power available onboard for various seasons for the two reference orbits (assumed orbits that we could get a ride to). 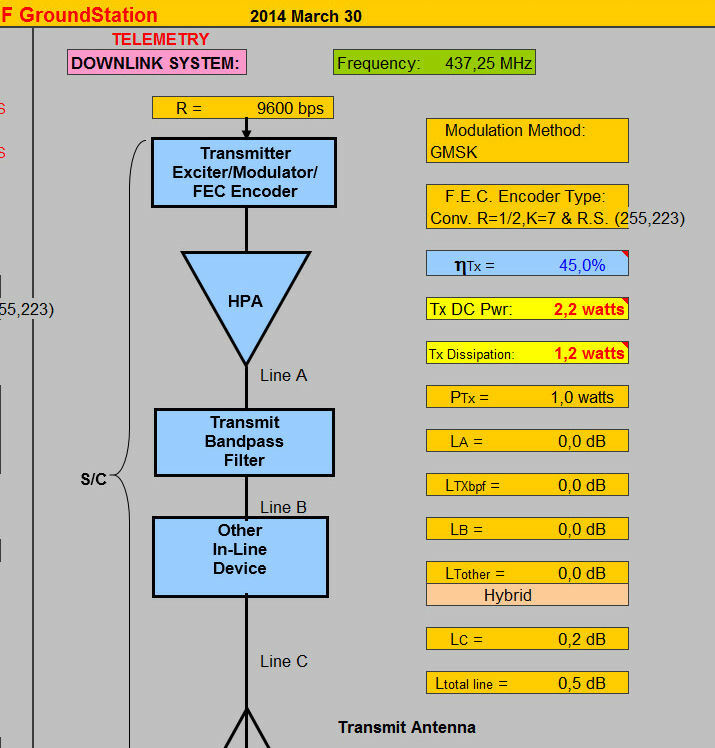 The ability to transmit data to the ground is dictated by something called a link budget which describes all losses and gains on the path between transmitter and receiver on the up- and downlink. We have started by studying in minute detail the link budget for the SEAM satellite – the sister Cubesat project that KTH is co-ordinating – see the picture below. 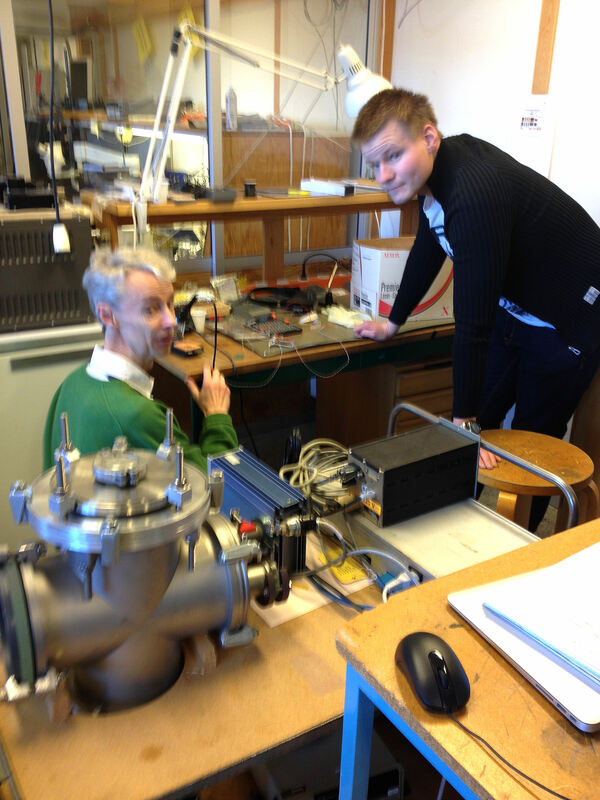 Andreas Berggren and his thesis supervisor Lars Bylander have completed the first round of thermal conductance measurements in vacuum (see picture) to support the mathematical thermal model that has been described earlier. Other activities are related to examining various options for cameras and onboard computers. First contacts, part of our market research, with suppliers of off-the-shelf subsystems for Cubesats have been taken. 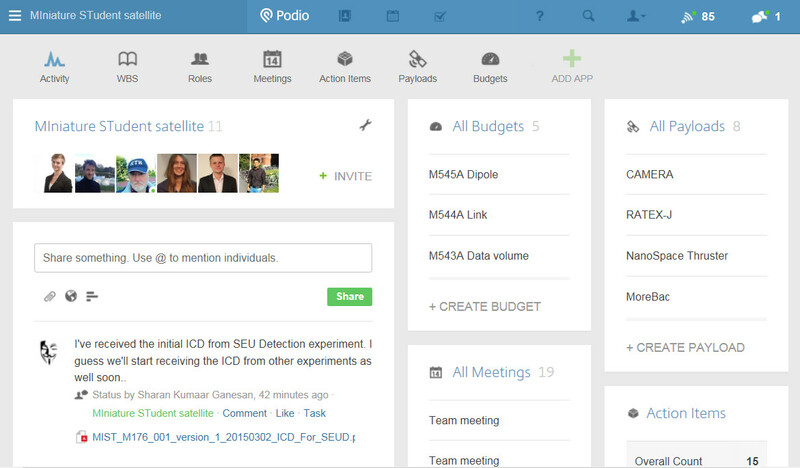 By the way, the project team uses DropBox to store all documents and the project work platform Podio for internal communications (see picture).